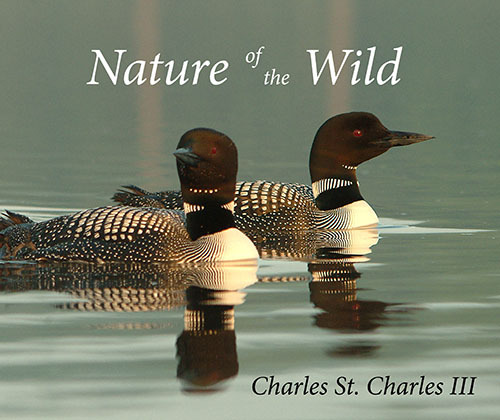 "The new book by Charles St. Charles III, is an enchanting compilation of nature, animal, and landscape photography. Mr. St. Charles has traveled throughout Michigan as well as western states, Mexico, and Taiwan. He photographed bald eagles in Alaska in minus 25 degree temperatures, "but the light was fantastic." This is a feel-good book, one that makes you happy to read it. His beautiful photographs span the seasons, and the last quarter of the book includes explanations of his photographic techniques. As he describes capturing his images, he ponders, "Just think, if there is this much beauty in six inches of our world, what do we walk past every day and never notice?" Some of my favorite photographs include a baby loon nestled on it's mother's back, trilliums, eagles, and baby foxes. This book can't just be thumbed through; you need to stop and smell the roses. -from a book review by Jeanne Carlson. "Your photography and your exuberant joy in the beauty all around us is an inspiration to me and to so many others!" - Jeanne B. "We wanted you to know how much we both have loved your book. Every picture is embued with the time, care and talent you nurtured them with. It's hard to imagine the patience alone that is necessary to reach that special moment when the lighting, subject and feel is just perfect. How many of us can capture our imaginations and visions the way you do? We especially love "On Earth As It Is In Heaven." We have traveled out west many times and the awesome landscapes we have found there are beautifully represented in this masterpiece." - Pat and Bill H.
"I love to peruse your book - it is enough to revel in your photos, but then they are enhanced, even more, if possible, by your descriptions. "...wave after wave of flowers...rise from the forest floor, launch into bloom and then fall back asleep..." Wow! But one of my favorites continues to be the 2 swans floating in the winter wonderland, 'Peace', and the story of your photographing them. "- Ruth S.
The book was beautiful. Both my husband and I were interested in the comments about the pictures and how they were made. Wonderful Work! - Dave and Doris L.
Nature of the Wild is a beautiful book with 101 full color photos on 124 pages that we are sure you will enjoy. Drops of Light - An amazing type of close up photography where images are shot through dew drops and rain drops, actually using the drops as a wide angle lens. Terra Illuminati - Landscape photography that "has the power to take you to places where your spirit connects with the land". These are mostly panorama images from around the world with an emphisis on Michigan. Nature's Palette - A celebration of the pureness of color and beauty all around us, these brilliantly colored photos are glimpses of Nature's Palette, of the paint of the planet. Life as Art - Wildlife photography that brings light and composition together with the pose and gesture of living animals. Symbols of Freedom - Photographs of Bald Eagles, symbols of freedom, strength, and independence. Notes - Notes about how each one of the photos in the book were captured. You can click here to explore a number of sample pages from each section of the book. Or you can click here to order the book. and if you would like free newsletters and field notes emailed to you click here.